Theater-headed valleys can form by groundwater seepage due to undercutting at the valley head where the groundwater comes to the surface. In a set of experiments I studied the effect on landscape development as result of groundwater from local or distal sources (Marra et al., 2015). In case of seepage from groundwater that first has to travel some distance, groundwater flow converges to only a few valleys (time-lapse video: http://figshare.com/articles/Video_1_Distal/1326217). 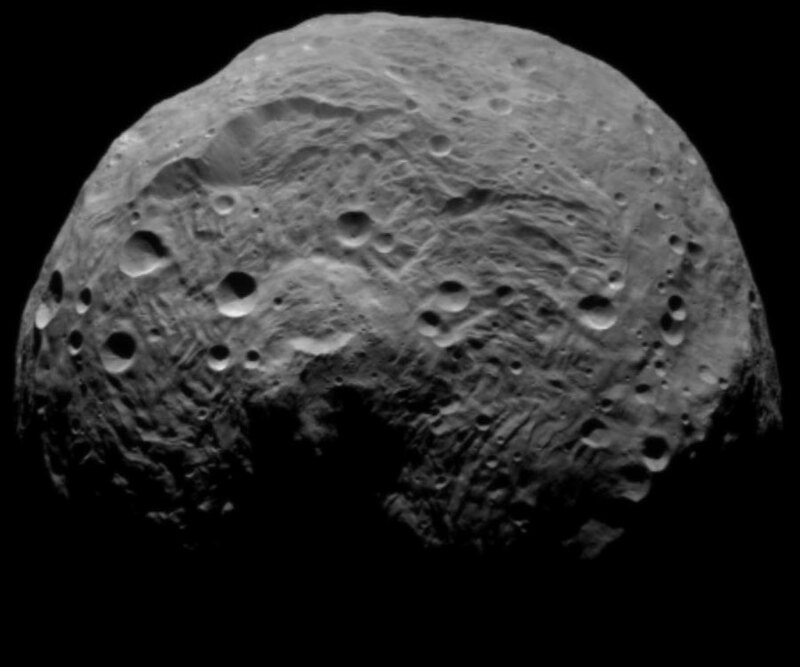 As a result, small valleys get abandoned and only the larger ones continue to develop, which results in a sparsely dissected landscape with several small and only a few large valleys (Image 1). On the other hand, seepage from nearby infiltrated groundwater, results in a landscape with many valleys as seepage is not influenced by the convergence of flow (time-lapse video: http://figshare.com/articles/Video_2_Local/1326218). 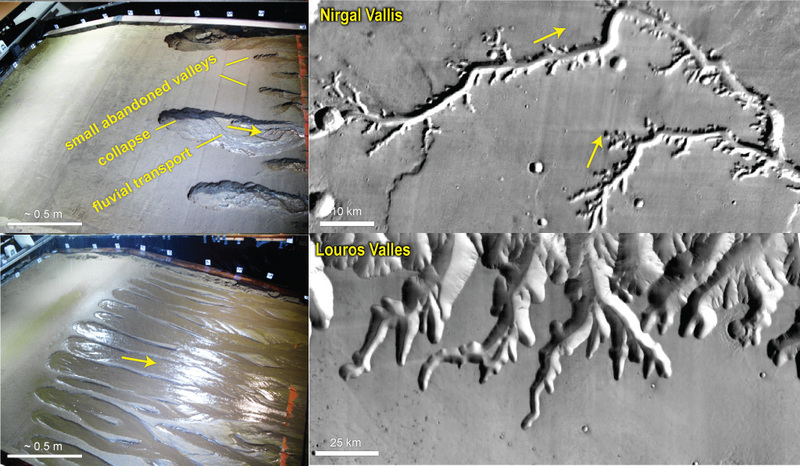 The valleys of Louros Valles on Mars show properties of sapping by a local source and Nirgal Vallis shows evidence of a distant source (Image 1). Image 2: Landscapes formed by pressurized groundwater outflow. Left are photos from the experiments, right are similar cases on Mars. Top images show pits at the source area where the groundwater was forced to the surface, and valleys further downstream. In Ganges Catena, the pits are tectonic in nature and downstream features show channels and streamlined islands indicative for fluvial flow. 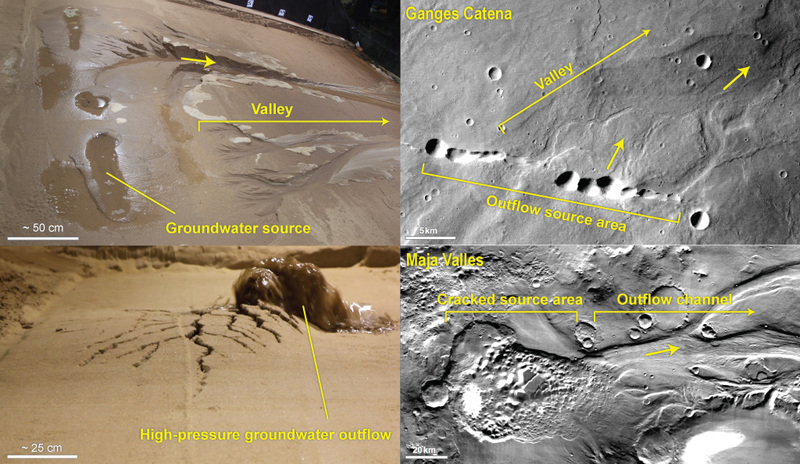 Bottom shows an extreme case where the groundwater pressure bulged the surface, resulting in a cracked surface reminiscent of the chaotic terrains on Mars. The source of Maja Valles is a classic example where such a chaotic terrain is the source of a large fluvial valley. Arrows indicate (inferred) flow direction. Top right image is HRSC Image H_8406_0000_ND3, bottom right is THEMIS daytime infrared. In a second set of experiments (Marra et al., 2014), I studied groundwater under pressure. 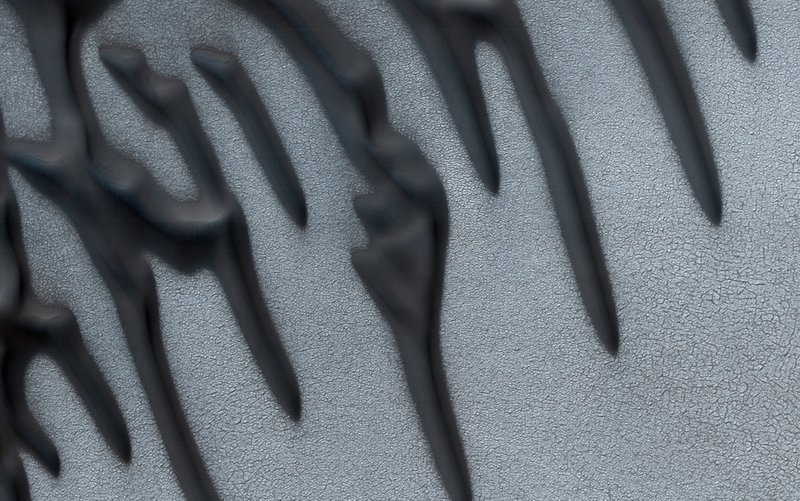 These experiments show that distinct outflow processes and morphologies result from different pressures. Low groundwater pressure results in a shallow surface lake and a channel when the lake overflows (time-lapse: http://figshare.com/articles/Video_1_Low_Pressure/1326226). At intermediate groundwater pressures, fissures form and groundwater flows out more rapidly (time-lapse: http://figshare.com/articles/Video_2_Medium_Pressure/1326227). At even higher pressures, the groundwater initially collects in a subsurface reservoir that grows due to flexural deformation of the surface. When this reservoir collapses, a large volume of water is expulsed to the surface (time-lapse: http://figshare.com/articles/Video_3_High_Pressure/1326225). Fissures, holes and cracks are at the source of many fluvial features on Mars, for example as show for Ganges Catena (Image 2). On Mars, these fissures relate the regional tectonic structure, which likely triggered the outflow the fissure ruptured a confining layer. The more extreme bulging from very high pressures can explain the enigmatic chaotic terrains that are the source of many large outflow channels, for example as shown for Maja Valles (Image 2). Baker, V. R., and D. J. Milton (1974), Erosion by catastrophic floods on Mars and Earth, Icarus, 23(1), 27–41, doi:10.1016/0019-1035(74)90101-8. 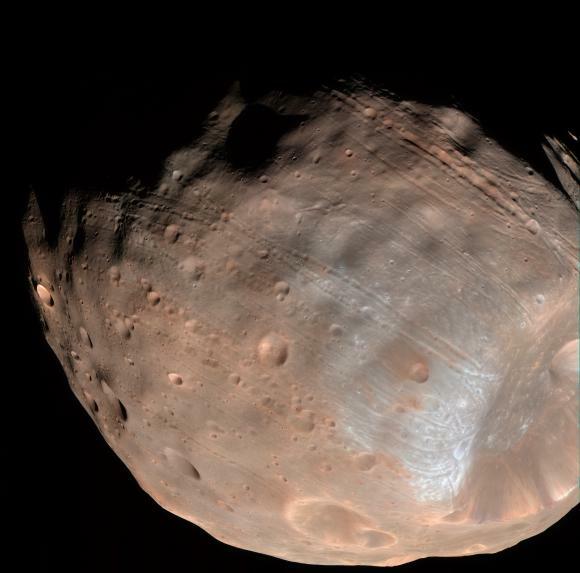 Craddock, R. A., and A. D. Howard (2002), The case for rainfall on a warm, wet early Mars, J. Geophys. Res., 107(11), 5111, doi:10.1029/2001JE001505. Marra, W. A., E. Hauber, S. M. de Jong, and M. G. Kleinhans (2015), Pressurized groundwater systems in Lunae and Ophir Plana (Mars): Insights from small-scale morphology and experiments, GeoResJ, accepted manuscript, doi:10.1016/j.grj.2015.08.001. Marra, W. A., E. Hauber, S. J. McLelland, B. J. Murphy, D. R. Parsons, S. J. Conway, M. Roda, R. Govers, and M. G. Kleinhans (2014), Pressurized groundwater outflow experiments and numerical modeling for outflow channels on Mars, J. Geophys. Res. Planets, 119, 2668–2693, doi:10.1002/2014JE004701. Marra, W. A., S. J. McLelland, D. R. Parsons, B. J. Murphy, E. Hauber, and M. G. Kleinhans (2015), Groundwater seepage landscapes from distant and local sources in experiments and on Mars, Earth Surf. Dyn., 3(3), 389–408, doi:10.5194/esurf-3-389-2015. Marra, W. A. (2015), Martian groundwater outflow processes and morphology – reconstruction of paleohydrology using landscape evolution experiments, PhD Thesis, Universiteit Utrecht. ISBN: 978-90-6266-393-4, http://dspace.library.uu.nl/handle/1874/311674.